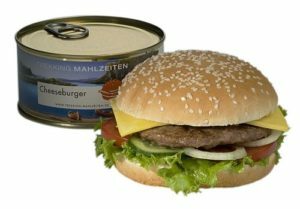 Cheeseburger in a Can is Here - Best Canned Cheeseburger Site Ever! The Cheeseburger in a Can is here! I can taste it now. The start of a new trend, a tasty fad, a delicious find at your local Can Can Sale! The clever Swiss people have made available for us a product for the new millennia. Made for the extreme athlete, the all terrain camper, or the desert fox, this canned goodness will withstand the toughest conditions. It’s an import that is giving restaurants a run for their money! 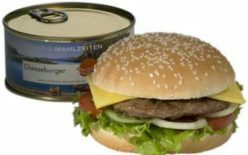 The cheeseburger in a can is a tasty, or maybe awful, treat for any fan of the hearty sandwich made popular by American fast food chains or just grilled up in your back yard. The uber-freshness of this canned patty will make everyone’s hearts sing knowing that only a piece of thin aluminum stands in the way of your drooling taste buds and the beefy hamburger. Mmm! Let’s explore every aspect of this great cheesy treasure and share with the world the benefits of innovation and technology. With the cheeseburger in a can, and the advancement of internet Web 2.0, we can discover more great finds from around the world which can change the lives of many. Since the spawn of SPAM in a can, man has been waiting every moment to find this ultimate canned discovery! Back in the 1930s the modern hamburger was born. 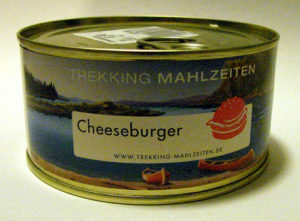 A little over 70 years later a Swiss company by the name of Trekking-Mahlzeiten, a subsidiary of Katadyn, helped the hamburger evolve yet again – by canning it. The company specializes in creating and selling ready-meals for the outdoor enthusiast. With a shelf-life of up to 12 months the canned cheeseburger can simply be tossed into a pot of boiling water. After a couple minutes you can pull it out, crack it open and enjoy the comforts of home while out on the trails. Recently a company in Germany has created a new version of this innovative product. Never to be caught napping in their lederhosen, these folks upped the ante by created a canned Bacon Cheeseburger. We have an entire post dedicated to the bacon cheeseburger in a can. It contains a video and complete run-down by a brave man who had a friend in Germany purchase it for him because it is not available in the US. He displays, opens and even tries it…someone has to be the first. 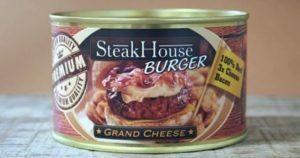 Cheeseburgers in a can are here forever!